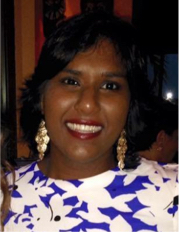 Aditi Ramcharitar has lived in Palm Beach County for most of her life. She has a passion for patient education along with health and wellness so that patients may achieve their maximum potential of healing to resume activities they enjoy doing. She earned her Bachelor of Science in Health Sciences from the University of Central Florida. She then attended Nova Southeastern University in Ft. Lauderdale and completed her Master of Medical Science with a focus in Physician Assistant studies. She is a certified physician assistant licensed in the state of Florida to practice medicine.